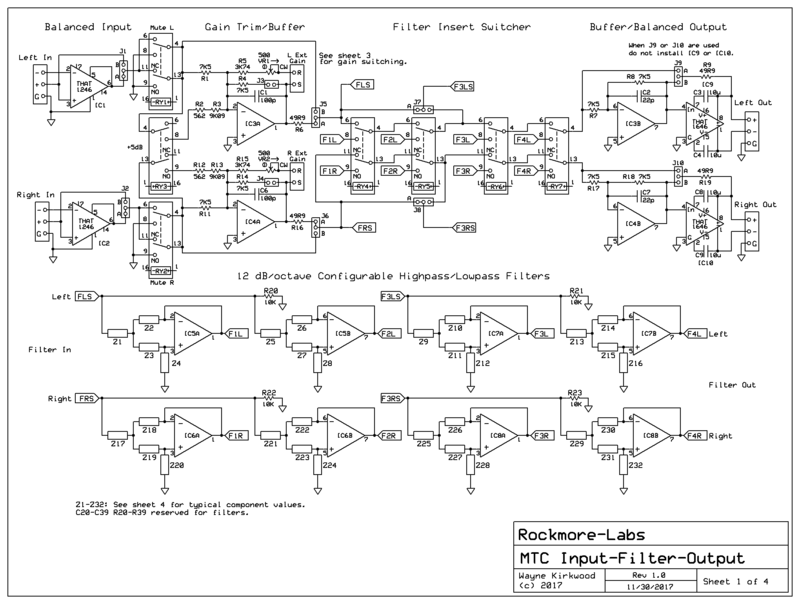 Mastering Transfer Console input, gain, filter and balanced output PC board construction information. Two are for the base IGFO board (12/24V relay), the third for the gain switch assembly, and the fourth for the filter tuning resistors. When ordering filter components for multiple boards make sure the number tuning capacitors are correct. The LF HP sections use two 0.33µF per filter section (four for two channels). The HF LP sections use one each 1000pF and 470pF per filter section (two of each for two channels). This bill of materials is for the MTC-IGFO board configured for 2 HP and 2 LP filters. It includes THAT ICs and capacitors for filters and some of the resistors. The following two BOMs do not include resistors to tune the filters or resistors for the gain switch. The 24V version is recommended when the external relay supply voltage is >24V or the audio supplies are used to power the relays. These are the 23 resistors needed for the Gain Switch. Only 1 resistor of each value are needed per channel. The BOM shows 10 of each resistor because its almost as cheap to buy 10 each as it is 1. Some of the values are not available in Xicon (271-value) and they are shown as KOA. Occasionally Xicons will be backordered and KOA values can be substituted. This list is for the the filter tuning resistors. This list has all the values for 20, 30, 40, 50 Hz HPF and 12, 14, 16, 18, 22 and 27 kHz. Move the BOM to your cart and delete the resistors you don't need. There are 20 each in the BOM which are more than needed for most builds. Please refer to the schematics for the proper values. Balanced Output to drive an Insert Switcher. The board does not provide input source selection. This decision was made to maintain simplicity and a less than 21 square inch footprint. The MTC's high and low pass filters use banks of Sallen-Key stages instead of switching a single filter's tuning components. A "two pole" 12 dB per octave filter requires a two pole switch. By duplicating filters and switching only their outputs, the need for expensive multi-pole switches is eliminated. 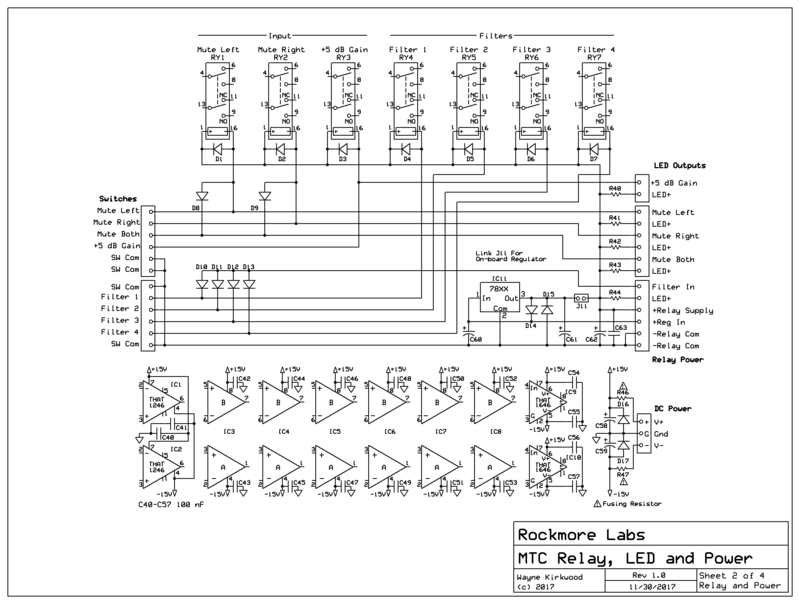 Relay-switched filter outputs allow multiple channels to be controlled by a single-pole switch. Four filter frequencies for Left and Right are available per board. 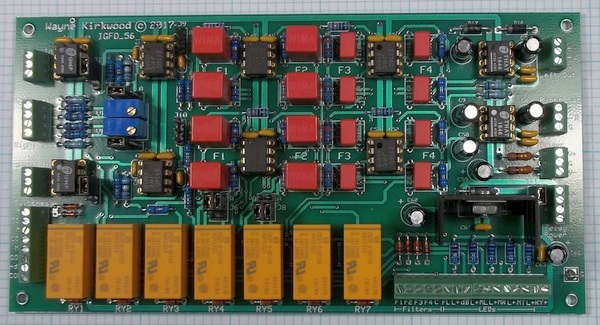 For applications requiring more than four filters, partially-assembled boards can be cascaded. A signal path with 4 high pass filter frequencies and 4 low pass filter frequencies requires two boards. One board has the balanced input, gain stage and four HP filters. The second board has four LP filters and the balanced output. 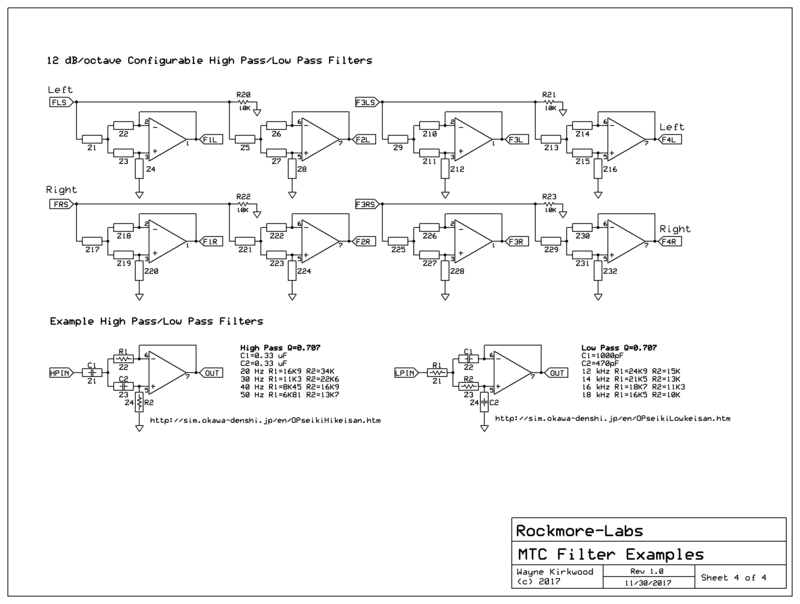 Sheet 4 of the schematics provides examples of filter configurations. The example filter frequencies are High Pass at 20, 30, 40 and 50 Hz and Low Pass at 12, 14, 16 and 18 kHz. Mastering Transfer Console Input, Filter, Output Stages. A THAT1246 provides balanced inputs. Relays RY1 and RY2 provide individual Mutes for the Left and Right Inputs. IC3A and IC4A are a variable or fixed gain stage. RY3 increases the Left and Right Gain by +5 dB. An external variable resistance, 0-10KΩ, varies the gain of IC3A from -5.5 dB to +5.5 dB. VR1 calibrates the lowest gain step to exactly -5.5 dB with Rexternal at 0Ω. J1 bypasses the THAT1246 input for board cascading or unbalanced input. J1, the Mute relay NC contacts and J5 link the input connector directly to the filter insert switcher for board cascading. The filter inputs are driven in parallel by IC3A/IC4A with the option of the last two filters being cascaded from the output of the first two. When J7 is in the A position all four filters are fed in parallel. Placing J7 in the B position allows cascading the second two filters to the output of the first two. An example of cascading would be to have the first pair configured as HP filters and the second pair as LP filters. This would provide HP filters of 20 and 40 Hz and/or LP filters of 14 or 18 kHz. The A position is used when two boards are cascaded and more than four filters are required. The B position is used for a single board providing four filters. RY4-RY7 are an insert switcher that select which filter output appears in the chain. When no filters are selected the insert provides hard wire bypass. 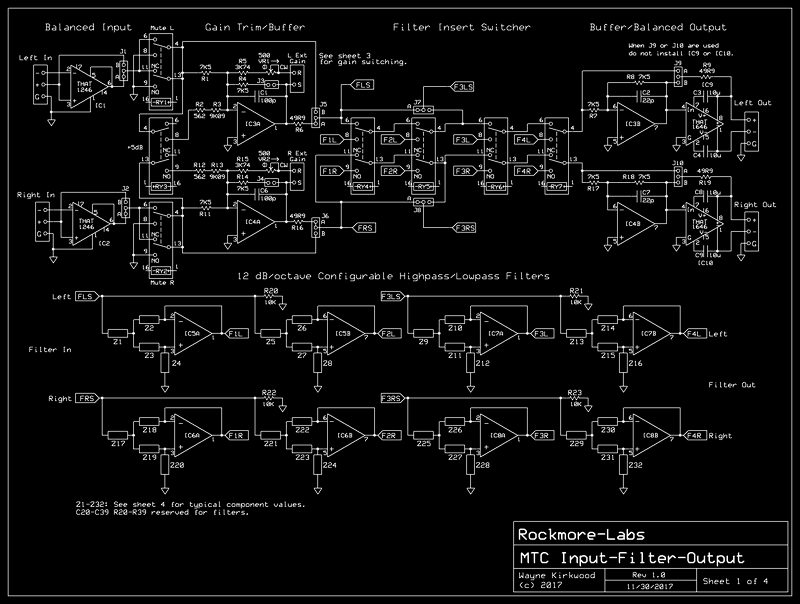 IC3B/IC4B are a unity gain inverting stage to supply a "0Ω" source impedance to the THAT1646 balanced output. IC3B/IC4B also correct for the polarity inversion of IC3A/IC4A. J9 in the A position allows the filter insert switcher output to cascade directly into a second board. J9B lets IC3B/IC4B drive the output directly. When J9 is used the THAT1646 should not be installed. A THAT1646 on the final board provides a balanced output to drive the transfer system's insert chain. The MTC filters are standard unity gain Sallen-Key filter blocks. Because the filter blocks can be either high or low pass, impedances (Z1-Z32) are used to represent resistor and capacitor component locations. 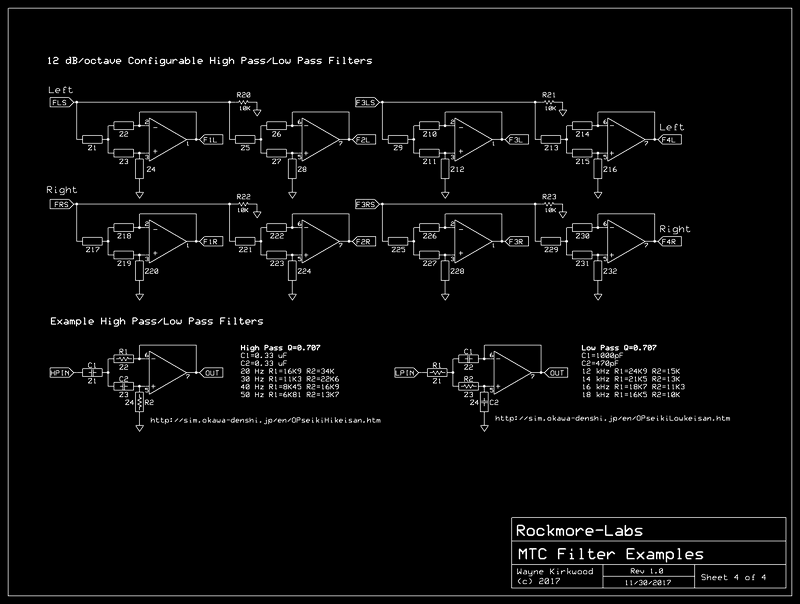 The filters are configured as high pass or low pass depending on where the PC board's components are loaded. Tuning component locations on the PC board accept 5mm Wima film caps or 1/4W resistors to allow a common layout to be a low or high pass filter. 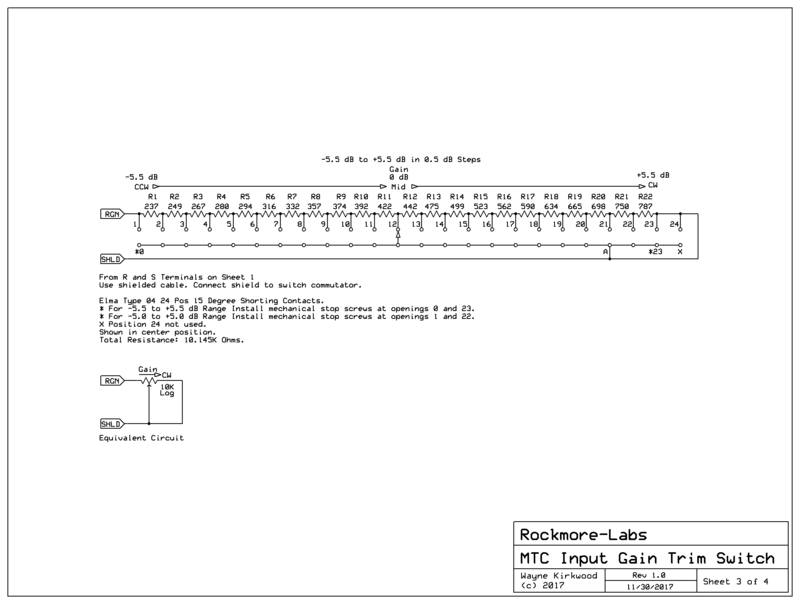 Schematic sheet 4 illustrates the transformation from high to low pass by swapping the locations of Rs and Cs. Resistors R20-R23 provide an op amp input bias current path for low pass filter configurations during relay switching. Mastering Transfer Console Relay, LED and Power Distribution. The relay coil common is isolated from audio ground and has its own optional regulator. The MTC-IGFO can use either 12 or 24V relays with external or on-board regulation. When an external supply >24V is used, or when the relays are powered from the +/-15V audio rails (30V), the use of 24V relays and an on-board 24V regulator is recommended. RY1/RY2 are the individual Left and Right Mute relays. D8 and D9 allow Stereo Mute capability with a single contact closure. RY3 is the +5 dB Gain relay. 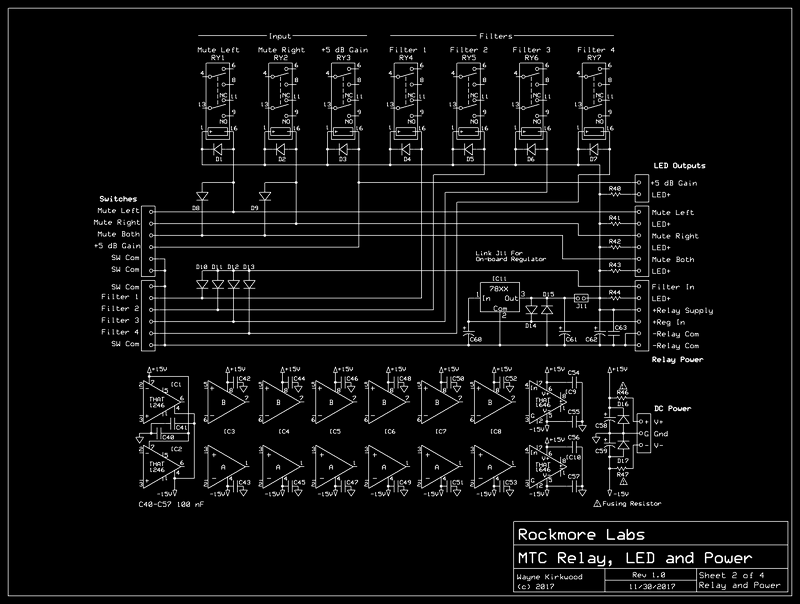 RY1-RY3 also have current-limited LED tally outputs for switch illumination. RY4-RY7 are the filter insert relays. Diodes D10-D13 provide a current-limited LED output when any filter is engaged. Mastering Transfer Console Gain Switch Detail. The gain switch is designed around the 24 position Elma Type 04 15° shorting rotary switch. 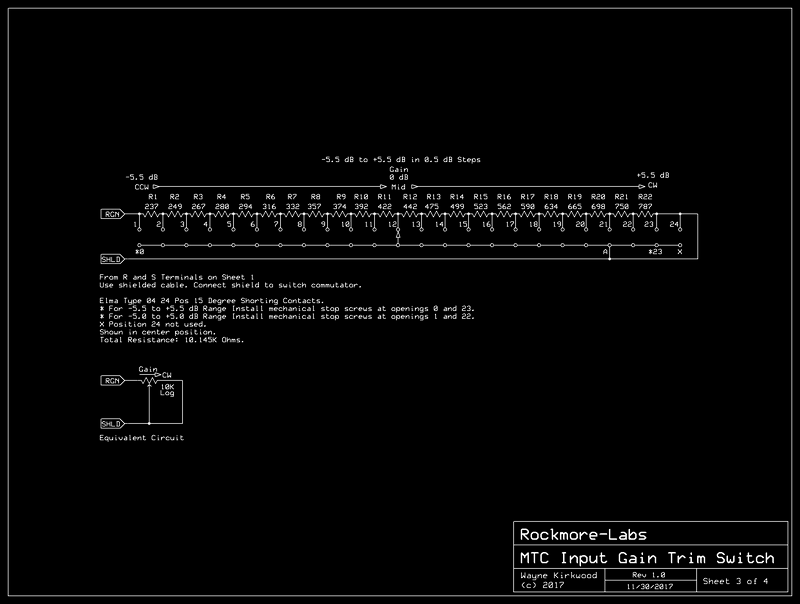 Note that the cable shield to the switch is driven by IC3A/IC4A's output. The driven shield makes the shield-to-center-conductor capacitance of the cable beneficial to the circuit because it is in parallel with the feedback resistance. Mastering Transfer Console Configurable Filter Examples. Thank you for the Build Thread for the MTC-IGFO! I am currently making the gain switches, however I ran into a dilemma I was hoping to get clarification on. When connecting resistors, I noticed position 12 being particularly challenging to fit. Is it ok to place resistors as to how I have them placed in the picture, as long as the leads do not touch the previous and next positions? Is there another positioning that is recommended? (See attached. Sample resistors are in position 11, 12, 13 to test fit, and I'll swap with correct value/placement ...as well as reflow the solder and check connections in other pins accordingly). When connecting R and S, R connects to switch position 1, and then S to A. Should S also be connected at position 23? Or should I connect position 23 to 24 using a resistor leg, and then connect S to that in place of position 23 (in addition to A)? Should I connect S to A, and A to Position 23? Or is simply a connection from S to A ok? Asking for the future, but I'm currently leaving position 1 and 23 unsoldered to accommodate accordingly! Please let me know what is recommended, any advice or expertise is greatly and always appreciated! When connecting resistors, I noticed position 12 being particularly challenging to fit. Is it ok to place resistors as to how I have them placed in the picture, as long as the leads do not touch the previous and next positions? Is there another positioning that is recommended? What you have looks OK. I realize that the area around pin 12 is a little difficult and that you have to reverse the order of the second-to-last resistor in the photo. What you might do is have the right-hand-most resistor in the photo (where it reverses back to the original orientation) laid in over the one before it rather than side-by-side. If it were me I'd read every one with an Ohmmeter before soldering them permanently. Should S also be connected at position 23? Or should I connect position 23 to 24 using a resistor leg, and then connect S to that in place of position 23 (in addition to A)? Should I connect S to A, and A to Position 23? Or is simply a connection from S to A ok? I would connect both S (shield BTW) to A and position 23/24. The switch is make-before-break but if it should momentarily open during switching (due to dirt) you want A (the commutator), S (the shield) and the end of the resistor string connected together. Position 24 isn't used because there should be a stop screw installed to make it 23. Pin 24 however does serve as a tie point. If you tie 23+24+A to S then it won't go open loop if you forget to install the stop screw and crank it to position 24. If you decide that jumping from 23 to 24 sacrifices neatness then do make sure A, S and 23 are tied together. I should also mention that the gain calibrations, VR1 and VR2 , should be done with the gain at -5.5dB (or -5.0) and J3/J4 open. VR1 and VR2 will have no affect at settings other than the lowest step or two. Beautiful. Thank you for your reply! I was originally thinking of placing R13 before placing R11, and R12, and then laying those on top however, placing R11 and R12 then placing R10 and R13 over top as you mentioned makes it a little neater. I will most definitely continue to quadruple check as I go! That makes sense. I thought I had read that correctly to tie Position 23 to A. I'll most likely just tie 23 to A for cleanliness sake as per your suggestion! Thank you for the guidance and for the heads up on VR1, and VR2. I'll be sure to make the calibrations on the lowest gain and with J3/J4 open! Misjah van der Heiden of 24mastering.com sent me pictures of his transfer console using 4X MTC-IGFO, 2X EEQ-12 and 2X Stereo Width Controller for modulation plus preview. Wow... Absolutely beautiful, that looks amazing! I was hoping to do something similar, by having two cut off filter selection knobs. If I only use 1 IGFO for 2 HPF and 2 LPF options, can I use two separate rotary swictches to handle the LPF and HPF respectively? Perhaps taking the single Common and attaching 2 leads from the board to their respective Common on the switches? I was also curious about heat management. It looks like with the voltage regulator and heat sink, there should be enough room to fit in a 1U rack. Do you have any recommendations or concerns for heat in a 1U rack, or would you suggest 2u to be safe? Especially since I have 2 regulators with heat sinks (IGFO and MSII), I'm not sure if this will pose a bigger issue later when I begin to assemble it all together! Thank you for your time, and as always, any advice is greatly appreciated! The biggest ah ha moment I had when soldering Elma 04's was when I turned the switch upside down. Have the solder tabs pointed at the floor. Then hang the resistors off the tabs and solder. Let gravity be your friend. You sure can use two rotary switches when all the filters are on one board. The thermal issue you might run into is the regulator heatsink. It depends on the relay voltage and unregulated relay supply. You can always use a 12 or 24V switcher for the relays and not use the on-board regulator. Most of the boards audio supplies are <<100mA. Paul I like the idea of using gravity. It also causes the solder to flow away from the switch rather than into it. That's perfect, I'll plan to use two switches to handle this task! This is where I may need some more advice, as this is my first build that requires an external supply and am not sure how to proceed. I planned on using 24v relays, and the regulator suggested in the BOM for both IGFO and MSII, as I will be using the same power supply for both audio and relays (Meanwell 25W +/-15v power supply -> http://ka-electronics.com/shop/index.ph ... duct_id=74). Is there anything to keep in mind when connecting power to the IGFO with this supply? Any recommended way to connect power to, say, IGFO -> MSII -> insert switcher x2? Any best practices for ground connections? I would assume just keep audio and relays separate at the source, but i'm not sure whether to have multiple leads from the power supply on the back panel to the PCB's, or to connect from power supply to IGFO PCB, to MSII PCB, to Insert PCB, etc. Any advice or recommendations are greatly appreciated, this forum has been absolutely heaven sent! Thank you for all your help! Elma 04’s are very sensitive to overheating. If you end upbwith a noisy switch it’s damaged beyond repair. I’ve destroyed my share. It’s an expensive lesson. I think it’s worth the money to buy an unstuffed Goldpoimt if the potentiometer configuration works for the application.